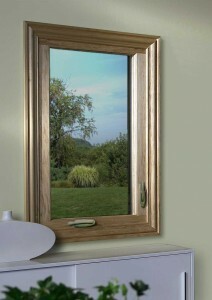 Casement Windows - IV Construction, Inc. Call us today at 815-223-2319 and follow us too! 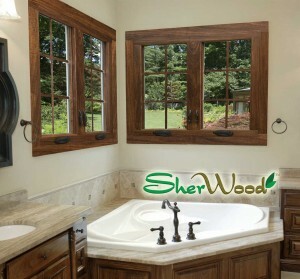 Sherwood windows are custom made to your specifications by our skilled craftsmen specifically for your home. These windows are engineered to combine the superior performance of vinyl with the amazing detail of hand selected Amish hardwood. Award-winning TimberView Technology marries wood and vinyl together without the use of screws, staples or adhesives. Hand-selected furniture grade oak or premium poplar hardwood interior is inspired by the sophistication and elegance of traditional wood windows. We offer unfinished or 11 professionally finished Sherwin Williams low VOC interior stains to compliment nearly any home décor. Each factory applied stain finish is followed with 2 coats of clear to give the maximum protection to your new wood windows. Standard white or clay exterior or 7 optional exterior colors to compliment the curb appeal of any home. Multi-chambered vinyl frame and sash provides the advanced strength, energy performance and weatherability of low-maintenance vinyl windows and are guaranteed never to rot, chip, peel or flake or splinter. 3-1/4” multi-chambered I-beam structural mainframe provides superior strength and rigidity while offering the most adaptability for all installation methods. Double paned Intelliglass high performance low E glass enhances insulation and reduces sound transmission. PPG’s Intercept Warm Edge spacer system’s structural design gives the best combination of energy efficiency and longevity, virtually eliminating condensation and seal failures. Comprehensive Accidental Glass Breakage Warranty guards against life’s unexpected mishaps. Operating hardware effortlessly handles the weight of even the heaviest sashes with smooth, quiet operation. Neutral light bronze aluminum screen frame with concealed retention system blends with natural wood tones and resists denting and bowing. Patented UltraVue™ screen mesh increases airflow and improves insect protection by utilizing a smaller mesh opening and thinner fibers than standard screens. This allows 25% more light, and fresh breezes to flow through while protecting against insects of every size. Additional coordinating products may be available, including Bays, Bows, Garden Windows, Geometric Shapes. Copyright © IV Construction, Inc.